Breathtaking landscape painted in oil on double primed canvas. 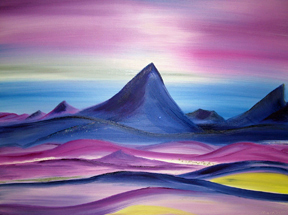 Deep blue, purple & pink hues take the eye on a journey of colour. Touches of grey, white, teal and yellow enhance the depth of vibrancy.